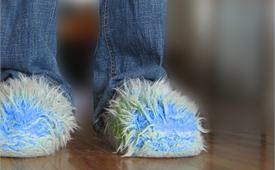 Since last week my Blue Monday post title was BRRRR. I thought today I would think spring. I think it is time don't you? 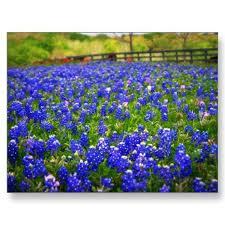 I can't wait to drive along the road and see a field of these. 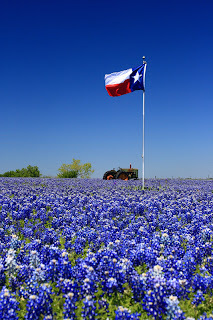 I love all the photo's of people, kids and pets in beautiful bluebonnet fields. This photo I found on the Ennis, Texas website. 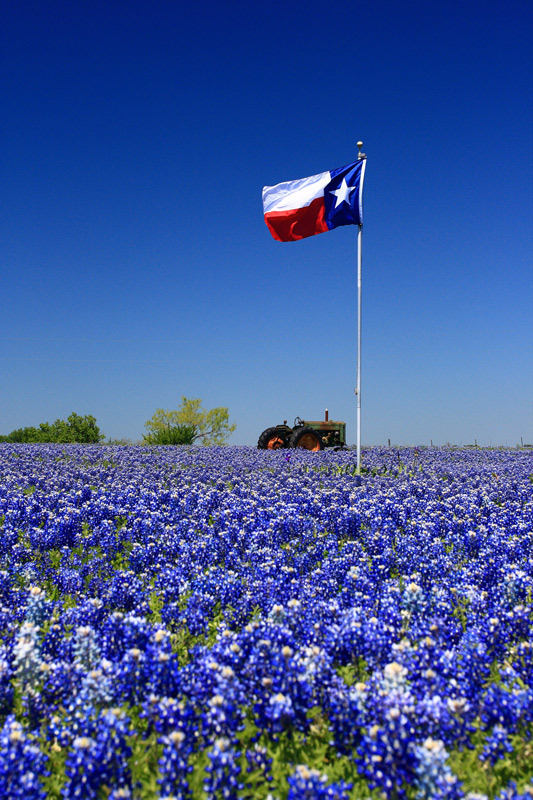 They have a Blue Bonnet festival. Think we will have to check it out. I hope you enjoyed a little touch of spring. 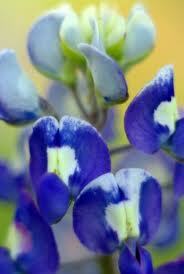 For more Blue's drop over at Sally's. Click here. Expecting a little (only a little I hope) of this . . .
Planning on wearing these while . . .
waiting on this . . . 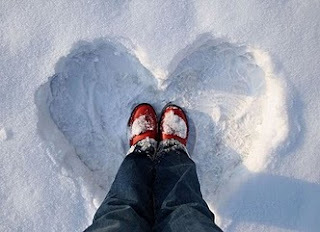 So are you enjoying frigid weather or waitin' on Spring. I am thankful today for my daughter. 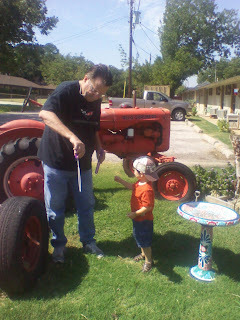 I am thankful for my grandson who will be 4 in May. I am thankful that I see smiles on their faces. I am thankful that God loves them and provides and protects them. Z's preschool had the sweetest Christmas party. We got to attend and of course I took tons of photo's. A couple of weeks before Christmas we went to church together on a Saturday night and then went to look at lights. We drove through our little down town area and they had an ice skating rink set up. It was really, really cold and Cowboy and I kind of wanted to just stay in the warm car. But the words that came out of my daughters mouth broke my heart. "We would not have been 'allowed' to do this before. We are going ice skating!" Cowboy and I looked at each other. Shut our mouths bundled up and watched them ice skate. You see. Our daughter was in a 5 year emotionally abusive marriage. She is still recovering. Our grandson is still recovering. But with counseling. And a lot of pray she is slowly but surely becoming her old self. I am thankful God allows me to have them in my life! If you have loved ones in a similar relationship. Don't give up. Don't give up on them when they say and do things you don't expect. Love them. Love them anyway. Love them always. And pray. Be thankful God is in control. Create in me a pure heart, O God, and renew a steadfast sprit in me. Wishing you a Blessed Scripture filled Wednesday. 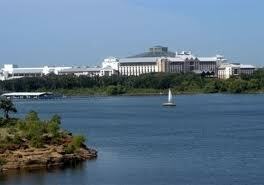 Where we will live, where Cowboy will work and the biggest decision if I should work. The last few years (2 to be exact) have been a huge struggle for us. In August of 2010 we were homeless. In September we were offered an Apartment Ministry position which seemed like an answer to prayer and a door opening. We took the position which included free rent. In December our supervisor was fired. And in February our position was terminated. Within only a few days we were offered a position at a boys home. We thought then. This is it. God’s sending us here. 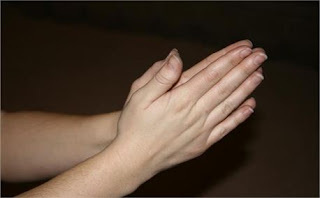 We gratefully accepted the position and began Praising God. We moved the end of February. It was a difficult time for us because we couldn’t get inter-net and Cowboy had to drive way too far to get to work. Gas was eating up every penny he was making. Cowboy did find another job much closer. But, then by April we were so disappointed in the position and what was happening with how the program was being run that we knew we could not stay. By May we had turned in our resignation and were asked to leave in 2 weeks. It wasn’t until June that we were finally able to move into our current home. Which turned out to be a cute little bungalow on the lake. (well at the end of the street) Although it is the smallest place we have ever lived we managed to ‘fit in’ the small space. All this time I have been looking for a job. Very shortly after moving into this small space we began to notice bugs. Everyday we began seeing more and more bugs. We began asking for the owner to exterminate. Well long story short. Even though they have finally had a professional come and begin a program it is too little too late. They have been here twice. Bugs still crawl across the counter even when I am cooking. I won’t share more detail. I am sure you really don’t want to hear more! We have been looking for a new place for a few months. Here’s where the prayer comes in . . .
Today we found an apartment that we will look at tomorrow. Our criteria was something less than $500.00 a month. What we found is less than $400.00 with washer/dryer and inter-net included. Hello. Did you hear that? Inter-net! Yea. And, today I received 2 job offers. One is pretty certain it is a part-time gig at the company my husband works at. Basically filling in for other personal. Just enough hours. The other is the one I really want. Call me crazy but it is managing a Non-profit Resale Shop. This is my heart. The draw back. The new apartment is 22 miles round trip to both jobs. The positive is the apartment is minutes from our daughter. And a short distance to the detention center where we minister currently 2 times a week. So, over the next few days we have to make decisions on housing and on jobs. We want to be in God’s will. I am afraid and I talked to God about this that Satan is tempting me with these job opportunities. That a job is what “I” want not what God has planned for me. This apartment sounds just so perfect. So, dear sweet friends, would you pray for us. Please pray that God will give us wisdom and discernment. And show us where he wants us to live. Help us to see His provision. And to know his plan for how that will happen according to His will and purposes. I am just so excited but yet worried and confused. The words to the song Sweet Sweet Spirit came to mind as I was thinking about what I wanted to share today. Yesterday we had the best time. I keep our grandson on Monday afternoon. But yesterday our daughter was sick so he came over early. They brought do-nuts. A sack of holes for him to share with Daisy. Daisy got 2. He got 8. Still working on the sharing. But you know she is a dog so she really didn't need that many. Right? After that we played awhile and then went to the lake. Daisy ran around and had a blast. And Cowboy and Z threw sticks in the water and rocks. And made big splashes. They had a great time. Dummy me. I didn't take the camera. The sweetest part of the day was when we laid down at 3:00 for 'a rest'. He doesn't like the word nap. But this grandma needs one. Anyway when we laid down and he asked me to sing Jesus Loves Me. (which is what I normally do.) I got through one verse. One verse humming and then I heard snoring. It was a Sweet Sweet time. The best. On a Sweet, Sweet Journey . . . 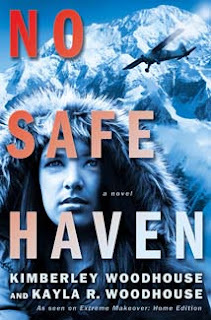 Since I started reviewing books about 2 years ago and, I would have to say that No Safe Haven by Kimberly and Kayla R. Woodhouse is the BEST book that I have read. the publishers site . . .
And, it is one that I found at the library. In fact I really didn’t even read the cover description because I was in a hurry. It was a new release. I read a couple lines on the description and figured it would be readable. I had no idea what category it really fell in other than it was a suspense. This book flat out Blessed me. It is the story of mother Jenna and daughter Andie are boarding their private plane and within minutes the suspense begins. Their flight is sabotaged and they crash land in Denali Park in Alaska. As the drama unfolds instead of their pilot (an old trusted friend) trying to ‘save the day’ he pulls out a gun and shoots the radio! It is once they land that the Blessing for me began. When Andie forgives the pilot and refuses to leave the plan until she has shared the gospel and prayed for him. As the suspense and intrigue develops both Andie and Jenna’s own faith is tested. The authors mom and daughter team Kimberly and Kayla do an excellent job of developing the characters and the plot. Only one man can keep them alive: Cole Maddox, the mysterious last-minute passenger who joined them on their flight. But trust doesn't come easy to Jenna or Andi and they both sense Cole is hiding something. Check this one out. You won't be disappointed. I was not asked by the author or publisher to write this review. Welcome to Thankful Thursday. I am Happy to be able to share my Thankful heart today. I have a short thankful list. Today I am thankful for my husband. My very own Cowboy. Today I am thankful that this is the view from the end of our road. Sometimes I get frustrate﻿d when things don't go as I have planned. Today was kind of one of those days. But the thing that changed all that was when Cowboy suggested taking the dog for a ride around the lake. And then we stopped and let her run and play awhile. It was kind. It was compassionate. I am Thankful my Cowboy took time for us today. I hope you have a long list like I do of things to be thankful for. Even if you only have one to share today go ahead and write about and link up. Click here to join Iris for Thankful Thursday. On a Thankful Journey . . .